From Thornley, served with 18th Battalion DLI (Durham Pals). Percy Cook was born on 15 March 1895 at Thornley in East Durham, and he was baptised on 8 April at Thornley Wesleyan Methodist Church. He was the third and youngest son of John George Cook and his wife, Ann (or Annie) Sarah Cook. John kept a greengrocers and fruit shop at Hartlepool Street, Thornley, and had done so from the early 1880s. Percy’s obituary in the Durham Advertiser notes that he intentionally shortened his course at Westminster College since he had been anxious to enlist (and in his service records his occupation is given as ‘student’, and his religion as ‘C of E’). Percy Cook’s arrival at the school is not mentioned in the school log book, nor is his departure on war service. However he joined-up at Durham on 3 April 1915 (although formal permission to enlist from the Education Committee is only recorded in September 1915). In fact, there is only one mention of Percy Cook in the school log book – a note, on 22 August 1916, that news had been received of his death on 27 July. Percy was posted to the 18th Battalion of the Durham Light Infantry, the ‘Durham Pals’. 18 DLI was one of the Kitchener’s Army battalions, raised from the enthusiastic flood of volunteers in the first months of the war, and it was unique in that the expenses for raising it were paid for entirely by the County of Durham. The battalion was formed and trained at Cocken Hall, and became part of the 93rd Infantry Brigade and the 31st Division. Percy joined the battalion on 8 April 1916 following its redeployment from Egypt to France. He trained as a bomber (responsible for clearing enemy trenches and dugouts after an attack) and was initially attached to the 3rd Entrenching Battalion (from which drafts were sent to line battalions). Percy was killed on 27 July 1916, age 21, only four months after landing in France. As part of the Battle of the Somme, 18 DLI were holding the front line at Neuve Chapelle and were subject to intensive artillery and trench mortar fire. In a German raid on the night of 27/28 July they suffered 79 casualties, including Percy. His parents received the news in a letter from Rev. C.R. Chappell, chaplain to the 18th DLI, ‘I buried him in the military cemetery just near the lines where his grave will be looked after and a cross erected. Later on, I hope to tell you the exact spot where he rests’. He is buried in St. Vaast Post Cemetery Richebourg-L’avoue, north-east of Bethune. Official confirmation of Percy’s death did not arrive until early September, and a special service was held at Thornley Wesleyan Methodist Chapel in memory of Percy Cook on 5 November 1916. Following his death his mother wrote to the army asking whether some of his possessions – a gold signet ring, silver wristlet watch, silver cigarette case and letter writing pad – had been found, but received a negative reply. This was a double tragedy for the Cook family and for Thornley Council School. Percy’s brother James, also a teacher, had been killed at the Second Battle of Ypres on 26 May 1915. Residence: Hartlepool Street, Thornley, County Durham. 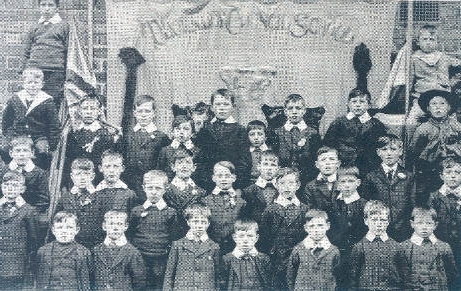 Education: Henry Smith School in Hartlepool. Student Teacher at Wheatley Hill Council School. Family: Parents: John George Cook and Ann (or Annie) Sarah Cook. 18th Battalion of the Durham Light Infantry, the ‘Durham Pals’. 93rd Infantry Brigade and the 31st Division; Egypt to France, Battle of the Somme. Memorial(s): County Hall Memorial, St. Vaast Post Cemetery Richebourg-L’avoue, north-east of Bethune.